Reader Grace Yuhasz was lucky: her grandmother was a home economics teacher. Lucky enough to benefit from the work product of a competent cook. Even luckier since she left her a collection of recipes. But that raises a question that has Grace puzzled. Great question — and good for Grace for thinking of copyright before just publishing! Fortunately, there’s also a pretty good answer in the case of most recipes. So the list of ingredients to be used in a recipe — a mere statement of fact — can’t be copyrighted at all. But what about the “description (or) explanation” — the step-by-step directions of what to do with those ingredients? And photographs that are used to illustrate recipes are definitely copyright protected and shouldn’t be republished without permission. Nor can you simply copy a whole cookbook, since that may be protected as an entire work. There’s still an additional issue, even with recipes — plagiarism, or passing off someone else’s work as your own. It’s still an ethical violation to claim credit as the original developer of a recipe when you’re not. So Grace will want to be careful, as any good genealogist should be, in describing the origins of the recipes she publishes. 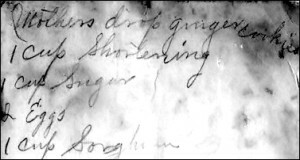 Just as we would describe a handwritten letter with full details (“sent from Grandma to Uncle Fred when…”),6 we would want to do the same with recipes like this. Bottom line: Stay away from photos and descriptions or directions that show originality. For the rest, go ahead and publish those factual, straightforward recipes, giving credit where credit is due. So timely for me, Judy. My sisters and I have been discussing creating a family cookbook blog and your advise is worth taking! This is wonderful Judy! I’ve started to add favorite family recipes on my genealogy blog, so this is great information to know. Thanks!! Glad you found it useful, Jana! Thanks, Jana! Sure do appreciate it. Thanks, Judy! Now a question: Flipboard is an app and a website that allows users to collect RSS feed articles, tweets, Facebook posts, etc., into an online static “magazine” that can be shared. Wouldn’t such a magazine, especially the RSS feeds, be subject to all the rules of copyright? Thanks Judy for summarizing the issue. Glad you found my article useful! Thank YOU for sharing your knowledge with the rest of us! Actually, family recipes can have genealogy research implications. Example: A little more than 4 years ago, there was a family gathering which was tacitly understood, given their respective health statuses, to be the last time my mother-in-law and her two remaining sisters would be together in the same room at the same time (one sister has since passed away, and the two surviving ones are now not up to any significant travel). There are various customs regarding what is or is not eaten during the Passover holiday, and those customs had differing rates of prevalence in different areas Europe (unfortunately, some adherents to certain such customs have effectively declared themselves superior to those having differing dietary customs). In order to get our facts straight regarding an ongoing conversation between my wife and some other relatives of hers, we asked my m-i-l and her sisters about how their mother (my wife’s grandmother) cooked soup for Passover. For all of my m-i-l’s cognitive issues, she emphatically remembered her mother’s matzoh ball soup, and was heartily concurred in by her two sisters. This told us what we needed to know, and there were some cousins around who were witnesses to the conversation. Great genealogical use of recipes, Ken!